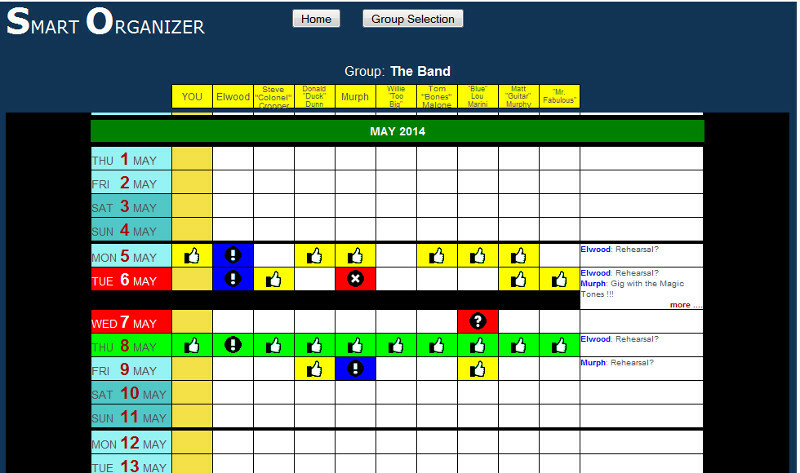 This is an example of how a 10 elements Band can benefit from the use of Smart Organizer to arrange its rehearsals and concerts. We assume that you have already read the page Concepts and Terms and then you are familiar with the basics of Smart Organizer. 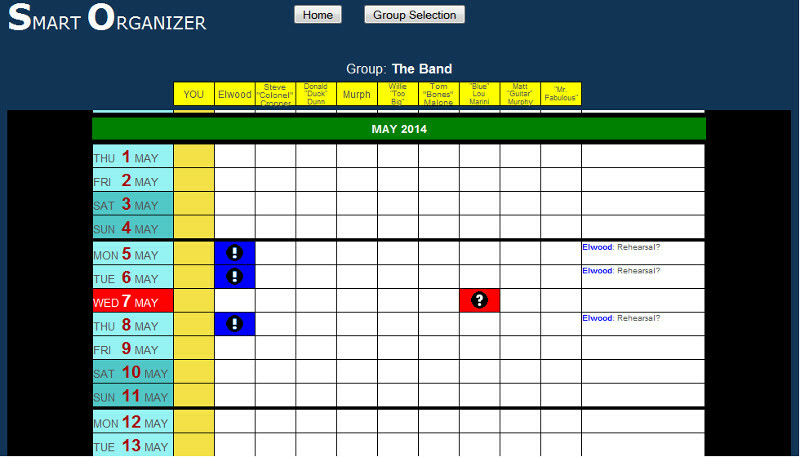 Any Band needs to arrange rehearsals and live exhibitions, where every element must be present. Talking about 10 musicians, sometimes can be a tough task using usual means like telephone calls, e-mails, SMSs, social networks and so on, because one says or writes that “any day is ok for me“, another that “any day except Tuesday and Friday“, a third that “any day except Monday and Friday” …. a real mess !!!! 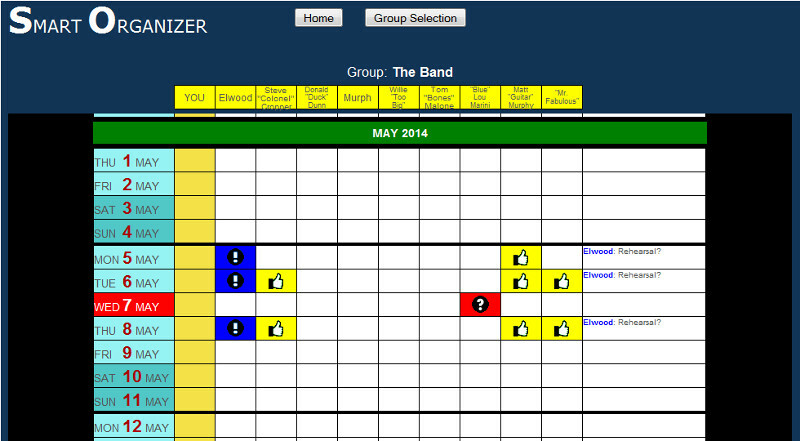 Let’s see how Smart Organizer simplifies everything. Then the rehearsal is arranged for Thursday May 8th ! 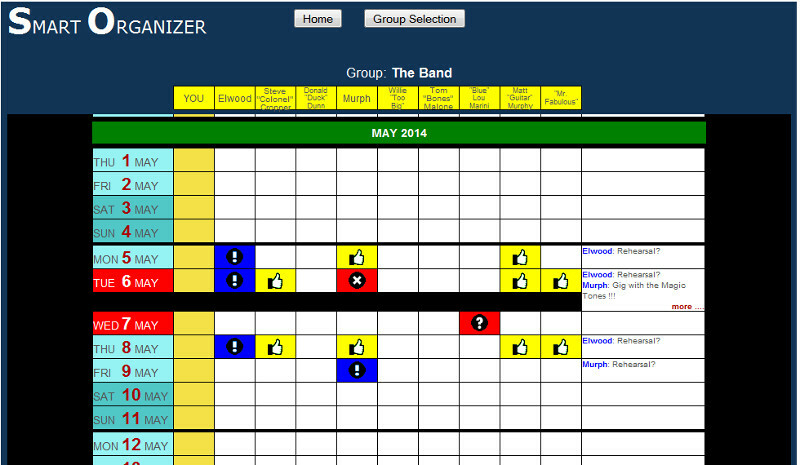 Note how entering into the Organizer page of the group “The Band” a glance is enough to understand that on May 6th and 7th there are no arrangements for sure with the Band (the day is red), while on May 8th there is a rehearsal agreed (the day is green). Imagine to reach the same result using telephone calls, e-mails, SMSs or social networks …..